Static saves a girl from a gang before rushing home. At school he’s clearly the class clown when the same gang comes back for the girl. He changes into static and confronts the gang, their leader turns out to have powers like him and he gets beat up. The girl removes his mask and finds out his identity. Family-Virgil and his mother have great chemistry and to a minor extent his sister as well. Characterization–Virgil comes across as the insecure friend you had in high school he feels the need to hide his inadequacy with constant jokes and one liners. His Peter Parker parallel is obvious from this first issue. Action-There was good action with an opening skirmish that was pretty neat. Art-Jean Paul Leon’s art has a distinctive style. 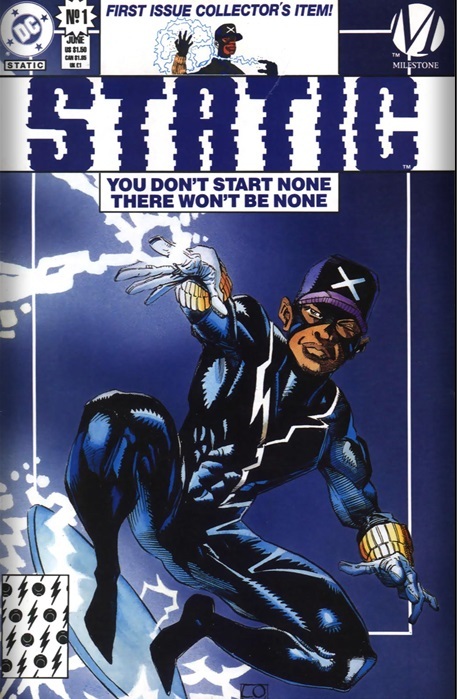 It does a very good job of illustrating Static’s powers. It has a very animated feel and over exaggerated though very emotive faces. The art seemed to match the tone of the story and the overall style of the dakotaverse. Cover-My favorite cover is the one with the predominant blue. It has a more distinctive feel though the alternative has Static on a red and orange background that truly pops. Move a few things around and this could easily be a black Spider-man tale 🙂 nothing wrong with that I’m just saying it’s pretty similar. I’m realizing an overall style in the dakotaverse that is really not my thing.